KATIE: We're all on active nurse duty here at the Townhouse. Pneumonia has once again popped in for an unexpected visit. WAFFLES: Mmmpf mmmf mmmff phfmmm mmm. KATIE: While Glogirly has remained healthy since her visit with pneumonia last fall, Gloman... not so much. WAFFLES: Mmmpf mmmf phfmmm mmm. KATIE: Although he kicked pneumonia to the curb almost a week ago, the blood-curdling, wake-up-the-neighbors cough has settled in for a nice long stay. KATIE: In fact, the coughing was SO bad, we almost didn't hear the *snap* last night. WAFFLES: Did someone say RIBS??? on those ribs of yours. 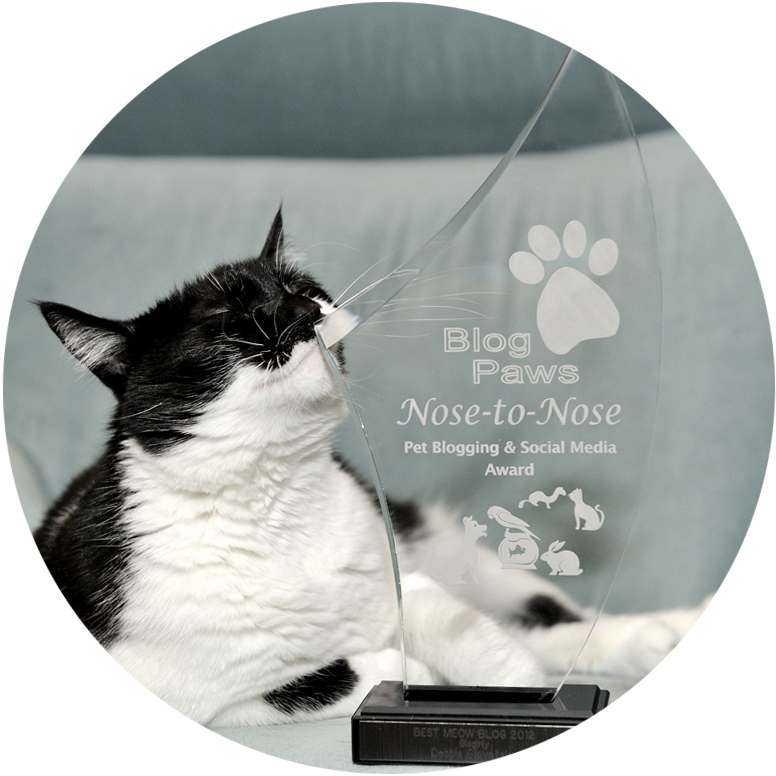 2 Days Left to Nominate Your Fave Blogs for BlogPaws Nose-to-Nose Awards! Just food for thought my cough lasted for months until my sister mentioned trying Marshmallow root. I took 2 caps 4x a day and it helped immensely and immediately. My lungs would loosen up for several hours after a dose. I stayed on it for 2 weeks straight. Oh my, good thing you have two nurses on active duty at the townhouse! We're sending Gloman get well purrs from all of us. Marshmallow root, I agree! Kicks those new moaning cooties every time. Oh no!!! Get well Gloman!!! Oh dear! We hope he feels better! Crapitty!!! Daddy did that two years ago and it was AWFUL. BIG HUGE purrs to Gloman from all of us. Oh noes! Poor Gloman. OUCH. I do hope he gets better soon. I would send goat hugs but I think that is the last thing he wants. Ouchie, wah wah! Never heard of someone cracking a rib by coughing but I guess its possible. Poor guy, Tell him I am sending positive poodale powers to him to speed up his healing. Oh no! Sending huge healing purrs Gloman's way. We hope Gloman gets rid of that cough as soon as possible. Jenna is sending lots of purrs, too. Cracked ribs from coughing? That's sounds terrible! Gentle hugs and prayers for you to get better quickly. Good thing Katie is on nurse duty. OMC, Gloman cracked his ribs from coughing? Poor human - that is a terrible injury to have to heal from because it hurts to laugh! That means nobody is supposed to make jokes around you. Waffles, you will really have to watch your behavior! Meanwhile, I will send some purrs his way. We've got some coughers here too. Ouchie!! We hope Gloman feels better soon!!! Oh dear! That sounds sooooooo painful! We purr-ray Gloman gets well soon! Oh no! Get well soon, Gloman. 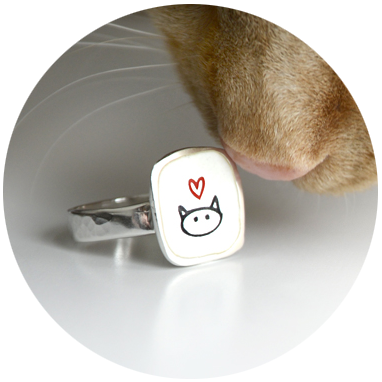 We are sending purrs, and will skip the hugs, because, well, you know why... no need to stress those ribs. Oh, no! Cracked ribs are one of the most un-fun injuries ever because you can't laugh or it hurts. Does that mean Gloman isn't allowed to read your blog for six weeks? We're purring that he mends quickly. Ultra gentle hugs from Magic and Red. Glad your two furry carers are on the case. O no feel better soon Mr Gloman!! With you two taking care of him, we're sure Gloman will be feeling better in no time. Purrs for him! Feel better soon Gloman. My mother in law broke her ribs the same way, coughing . well - ouch. Feel better soon Gloman!!! OMC momma cringed at da rib ouch! Sending healing purrs. So sorry that the Glowman has to deal with this. I say phhhtttt to pneumonia and ouchie ribs too! Get better Gloman, you kitties gots lots of purrs and cuddles to do to get him all better. Oh dear, you two are pulling some serious overtime there! Purring for Gloman to get well soon. Cracking ribs? Oh my GOODNESS. That's some serious coughing. Waffles and Katie, take good care of Gloman and make sure that you give Glogirly a little extra love too, since she is the Nurse in Charge. May the townhouse be restored to a clear bill of health soon! Ohhhh noooooooo!!! Poor Gloman!!! Please feel better soon!!! You have THREE nurses to take good care of you! Get well soon, Gloman! I hope that Waffles and Katie will lie BESIDE you and not ON you while nursing you back to health! OMD!!!! Cracked ribs from coughing??? That must be one severe cough! My best wishes to him for a speedy recovery!! So it sounds like you have your hands tied at the moment but I wanted to let you know I am passing awards on today and your name is there for 2 of them if you have a chance to pop by. OUCH! As if the cough were not enough! Oh Gloman we DO hope you get well soon. No one should suffer from THAT! I'm sending you big uniocular purrs from NC! Oh noooo, that stinks! We hope you both will take your nursing duties seriously! We send our best thoughts and purrs that he gets better SOON. Yikes! Healing purrs to the Gloman from all of us. Oh my, that's terrible! 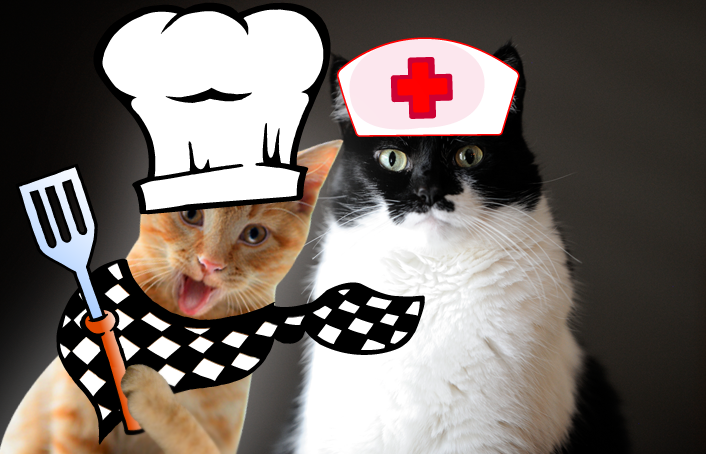 We send our healing purrs to Gloman! Glogirly, when will the Kritter Kondo giveaway results be posted? Oh MY!!! We posted the winner on Facebook and totally forgot to post here. So sorry! We hope Gloman feels better very soon!!! Sending purrs for Gloman to feel better soon. oh dear! sending purrs to Gloman! - Crepes. Sending lot of (((purrs))) to poor Gloman ! Oh, poor Gloman! We hopes he is feeling better furry soon. Oh noes! we hopes the new-monia goes away. Mum had bronk-eye-tis a few years ago, so we know about the coughing and hurty ribs. Holy Cod poor Gloman! Purrs! Poor Gloman!! Sending you good thoughts and well wishes. I had pneumonia once for three straight months and I remember how gruelling and exhausting those coughs are. It just kills you! Or cracks you some ribs! Poor you! Waffles and Katie, take good care of Gloman! 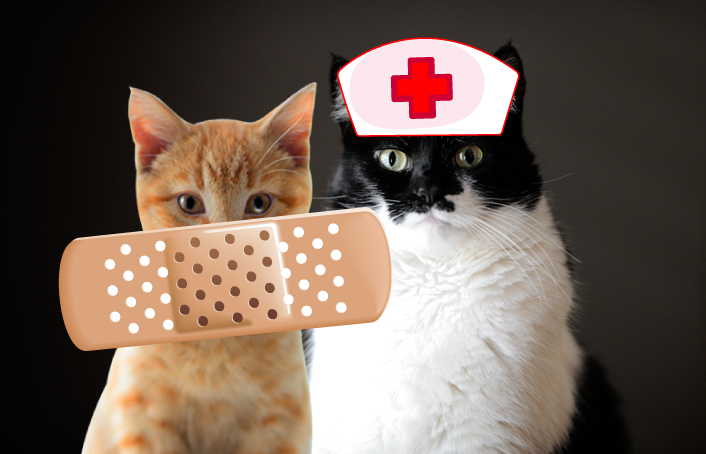 Sending more healing purrz Gloman’s way. The last person we knew who cracked a rib coughing was, ironically enough, TW’s old doctor. Wow, I didn't know that was possible! My daughter had pneumonia when she was 5 or 6. That coughing sure is horrible that goes with it... Feel better soon Gloman! Sending purrs and hugs from our house for Gloman. Hope Gloman is feeling better. TW sez when someone cracks a rib sneezing, it’s a sign of Osteoporosis, whatever that is. Healing purrs for Gloman, try not to make him laugh.